Number 1 Great 8 Bucket List – Whales!! Humpback, Dwarf Minke, False Killer, Killer, Short-Finned Pilot, Sperm and various Beaked Whales can all be seen in the Great Barrier Reef and around Lady Musgrave Island in season. With the Humpback Whale being the most commonly sighted species of whale on the Great Barrier Reef. 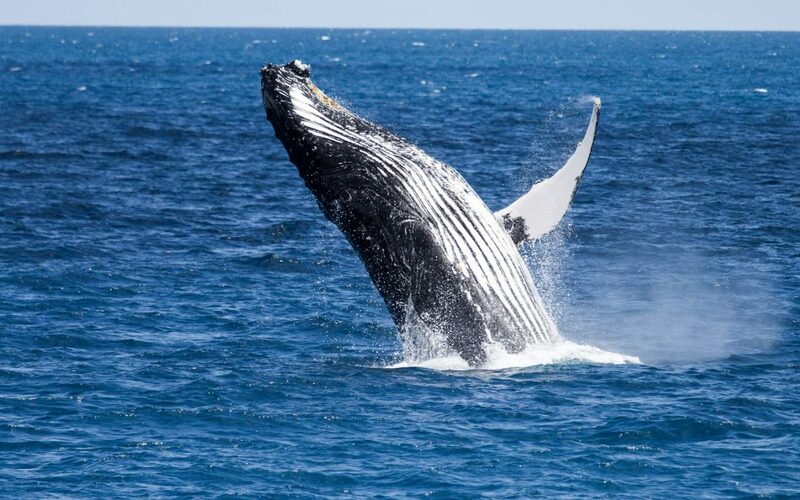 Humpback Whales are on the move along Australia’s East Coast from June-November each year. Swimming, Breaching and tail slapping their way up to the Great Barrier Reef to escape to southern winter chill and find a warm, sheltered spot to expand their family. Humpback Whales have a intriguing ability to ‘sing’ underwater. Songs are used to communicate with other Humpback Whales and can last for up to 30 minutes. Humpback Whales are considered the Giants of the ocean. Migaloo is one of the few known white Humpback Whales in the world.